Having your roof and/or gutters cleaned not only dramatically improves the appearance of your home, it helps guard against premature wear, leaks, and damage due to improper draining. Shepherd’s Company has been power washing roofs and cleaning gutters for Missouri home and business owners for over 20 years. We do employ a “soft wash” approach to ensure delicate treatment of your roof and shingles. Use us with assurance, and put our knowledge of debris removal and cleaning from rooftops and gutters to work for you. 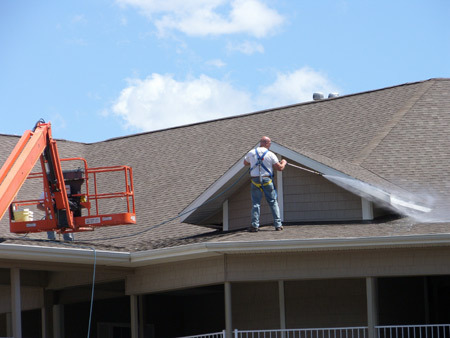 Shepherd’s Company offers gutter cleaning services to homeowners and businesses in the central Missouri market. Leaves, twigs, branches, and other debris can clog and even damage your home’s gutters, obstructing the passage of water. If your gutters are not properly draining rainwater or metled snow, it is possible for water to leak in and cause extensive damage. Having your gutters cleaned professionally gives you the peace of mind that water on your roof is draining properly without having to worry about expensive repairs. If you don’t yet have gutter guards, we also offer installation services. Over time, asphalt shingles can accumulate algae, mildew, and mold. If left to nature, these can severely degrade the life and longevity of your roof, not to mention detract from the appearance of your home. 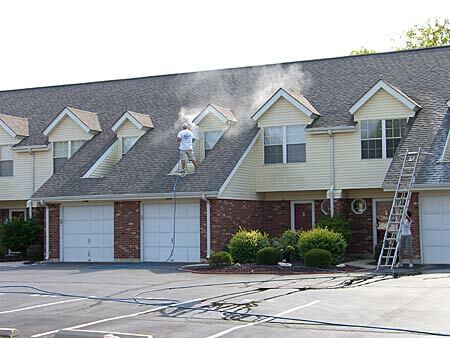 The cost of safely cleaning your roof professionally is far less than having the roof replaced. 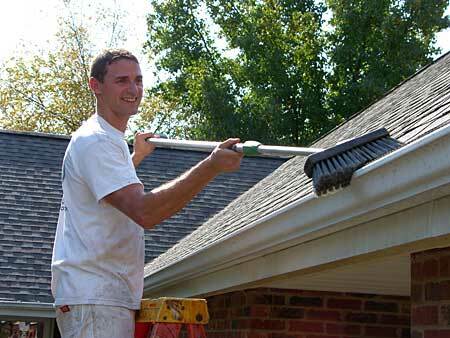 Roofs and gutters must be regularly cleaned and in good condition to function properly. Even with a leaf guard or gutter guard, it is possible for mold or roof grains to accumulate and spread inside your gutters. When you call Shepherd’s Company for your gutter cleaning needs, our team of professionals will safely clean your home’s gutters thoroughly. Our workers will clean your gutters by hand and, if necessary, remove any mold with a non-toxic biodegradable product. Our gutter cleaning services are environmentally friendly and will help protect your home year round. Contact us to schedule a time for us to come out and inspect your roof and gutters.